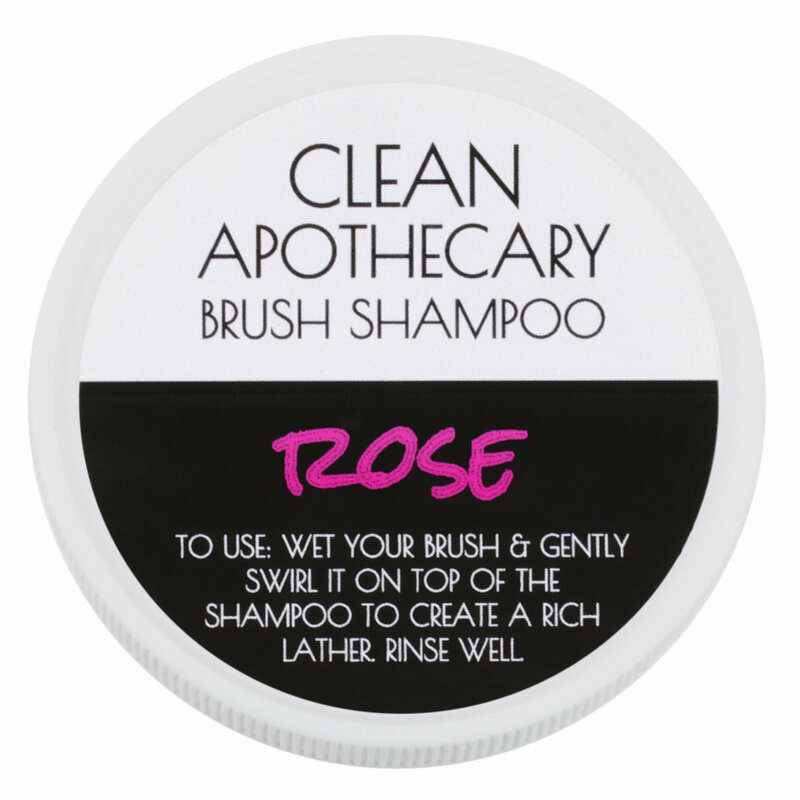 Wet your brush and gently swirl it on top of the shampoo to create a rich lather. Rinse the bristles clean, taking care not to get water in the ferrule. Learn more about cleansing natural makeup brushes. Due to this product’s natural formula, its color may change over time. This is a normal process that won’t affect its performance. Okay, so when I first saw Clean Apothecary's shampoo formula I was excited right away because I am a big fan of Argan Oil and I know that it's got a lot of great uses for skincare/cleansing/etc. When I was picking through the scents I noticed that they had grapefruit and thought that was a refreshing change of pace from the usual gamut of aromas (lavender, for example, which is also available from this brand) so I decided to go with that one. What a lovely scent, without being too overbearing! When you wet the product the fragrance activates a bit more and it makes the shampoo smell like it's actually "juicy" as opposed to the concentration of fragrance from, let's say, hand soap. Moving on to the performance, I decided to compare it to a few of my old standbys (Dr. Bronner's Castile Bar soap, London Brush Company Goat Milk, and good ol' Dial Antibacterial) to see how the formula held up. I used this product on a wide range of bristles: synthetic, vegan, white and black goat hair, horse, sable, and blue squirrel. After using this shampoo to deep clean about 30 of my regular-use brushes, I can confidently say that this product has vastly outperformed my other methods. I wet the bristles, give them a swirl or two (or three -- I got carried away with the scent!) in the shampoo, and work the brush in my palm until I see the color successfully lifting from my bristles -- then I rinse. One of my favorite things about this shampoo is the fact that the lather is much more subtle than my other methods, and as a result it doesn't seem to make such a mess or get trapped in the ferrule. (my other methods get VERY foamy. Not so much with the LBC but still noticeable enough) Even further beyond that, I am happy to report there is indeed truth in the company's claim that this shampoo conditions your brushes. I didn't think Blue Squirrel hair could get any softer, but lo and behold, I was made a believer. Regarding the lack of instructions, this shampoo conforms directly to my preferred method of cleaning brushes, (bar soap style, swipe in palm and rinse) so when I saw it, I felt instantly familiar. No instructions needed here! I am genuinely torn now, because my current favorite method (Castile Bar soap) is very inexpensive by comparison, but this product does its job SO WELL. I am also a firm believer that a good SAFE soap is an invaluable tool in your makeup arsenal. I only own one blue squirrel hair brush, and that brush alone is worth over 80 dollars. I am not going to use DIAL Antibacterial soap on an 80 dollar brush, you feel me? I wasn't even too thrilled about using Castile soap, but this Clean Apothecary shampoo... I could see myself having a future with this shampoo -- wife and kids type of deal. The thirst is REAL! Give this product a try if you want safely cleaned brushes that are soft, not stripped! I own a large variation of brush cleaning products, but this one is a true winner. I have the lemon version, and after looking up a really helpful youtube video on how to use it, I found that it makes brush cleaning even easier than my prior brush cleaning routine. If you use it the right way, it works like a charm!! You swirl your brush right under water into the soap to make some suds. The ridges on the surface area of the brush soap really help to get into the bristles of the brush, without harming them or roughing them up. I find that my brushes are squeaky clean but SO soft after using this brush soap. Better yet, there are no toxic chemicals to worry about! I was using baby shampoo to wash my Chikohodo and Wayne Goss brushes, but each time I cleaned my brushes, it took a really long time to get all the foundation out. Also, I was concerned that baby shampoo might not be the best for my gorgeous brushes. I trust Beautylish's impeccable taste in products, so I was glad to see a product line dedicated to giving my brushes a conditioning clean. I wasn't sure how to use it when it arrived - for some reason I thought it would be a cream, not a solid texture - so I called Beautylish and the wonderful customer service patiently explained how to use it. I've now used this product at least 3 times to clean all my brushes. It works SO MUCH BETTER than baby shampoo! Firstly, it cleans my Chikuhodo GSN series foundation brush like a charm: 2-3 swirls in the soap to create some lather, rustle around in my palm, and watch the foundation melt away. I repeat that 2-3 times (3rd time is unnecessary but I love doing it), and I've got a beautifully clean and conditioned brush. 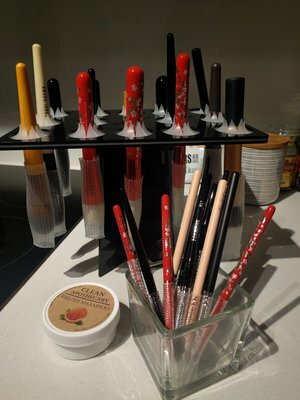 I set my brush into a Brush Guard (sold on Beautylish), hang to dry in my Benjabelle (also sold on Beautylish), and my gorgeous brushes that I've spent an arm and leg on are clean, conditioned, and happy. When the brushes are dry, I swear they're softer than when I first bought them. I didn't think that was possible, but it is. The brush shampoo scents are extremely subtle - honestly I don't smell anything unless I bury my nose in my brush (which I admit to doing when I first tried the product). I love this so much I just bought the Grapefruit. Best brush cleanser I have used! So... A long time ago I followed what a lot of youtube tutorials and washed my brushes with dish soap and olive oil. My brushes were so oily and gross after. It may be that I am just an idiot and I got the ratios wrong. Lol but I want things to be simple! After this, I started washing my brushes with only dish soap and followed up with a good natural conditioner. This worked but was time consuming. Now I have this brush cleaner that cleans and conditions in one go! And I swear to God, the makeup melts right out of my brushes making the cleansing process so much quicker! Smells greats, works quick and my brushes are so soft after! After washing and all the excess water out, I put my brushes into my brush guards and hang them on my Benjabelle brush tree. There was no instructions so I assumed that I wet the brush and swirl it in soap, massage in hand (in my case, my ridiculous Sigma brush washing glove), then rinse till water is clear. Really glad I made the purchase!! Can you be in love with a shampoo? Can you? I thought I was happy with my baby shampoo for my natural haired brushes but when we started carrying Clean Apothecary, I thought, well, the ingredient list seems pretty good and why not. SO glad I did. Not only am in love with the grapefruit scent, it cleans my brushes incredibly well and leaves them even softer than before. How is this even possible!!? And the fact that I'm not using any stripping or harsh ingredients for my brushes assures me that the care I'm providing my brushes with is stellar and they will last me quite a long time. To clean them, first I went my brush in a bit of water (be sure not to get water in the ferrule, as this can loosen the glue in the brush head), then swirl the brush in the shampoo. Next, I slightly dampen my palm and swirl the brush in the palm of my hand until it suds up, working the soap into the hairs to remove all the residue and makeup from the hairs. Then I rinse the hairs in a slow stream of water, gently squeeze out the excess and lay flat on a cloth to dry. That's it! Easy peasy and it gets everything out so clean and fresh. Thank you Clean for creating a product with such a great ingredient list. It makes me feel good to know that I'm using non harmful ingredients with my brushes and that I know exactly what went into the shampoo to best keep everything clean. Successfully made me a convert from my baby shampoo! This is by far my favorite brush cleaner I've ever used. I've used solid brush cleaners before but they were all really messy. This one is truly solid though and it doesn't take long to dry after you've used it, which I love. The other solid cleaners I've tried never seemed to fully return to being solid after using them and became very misshapen. This one held up great. And if that wasn't enough, the smell.....oh my God it smells amazing! I have the Rose scented one and I seriously wish it came as a fragrance! It's subtle, not too overpowering like most floral scents tend to be. It leaves your brushes ever so slightly perfumed which I love when I'm applying my makeup. Clearly I love this stuff, LOL. This product actually worked better on my beauty blender than the beauty blender cleanser. For the first time since I got my beauty blender it's black again with no foundation residue! The only reason I'm not giving it 5 stars is because there's no directions that come with it. I got home eager to try this out yesterday and let me tell you I was NOT disappointed.. it smells great and it washed all the black shadow off my brush (it's been stained for a while) honestly my brushes look brand new, smell good and are super soft and conditioned. amazing product! I usually use baby shampoo or Meyers soap to wash my brushes but I decided to try this bc it looked interesting (a SOLID shampoo? ??) This stuff is amazing! I wet my brush a little and add some water to the shampoo to wet it as well and swirl my brushes on it. EVERYTHING comes off. Some of my brushes have white bristles and shamppoo never quite washed out everything but this CLEAN brush shampoo did! I was amazed.